For pad printed items, all pricing includes 1-color, 1-location logo in stock colors. If specific PMS color match is requested, please add $30.00 per color. For more information please see below. PMS numbers listed below are approximations of stock inks. PMS color matches are available upon request. 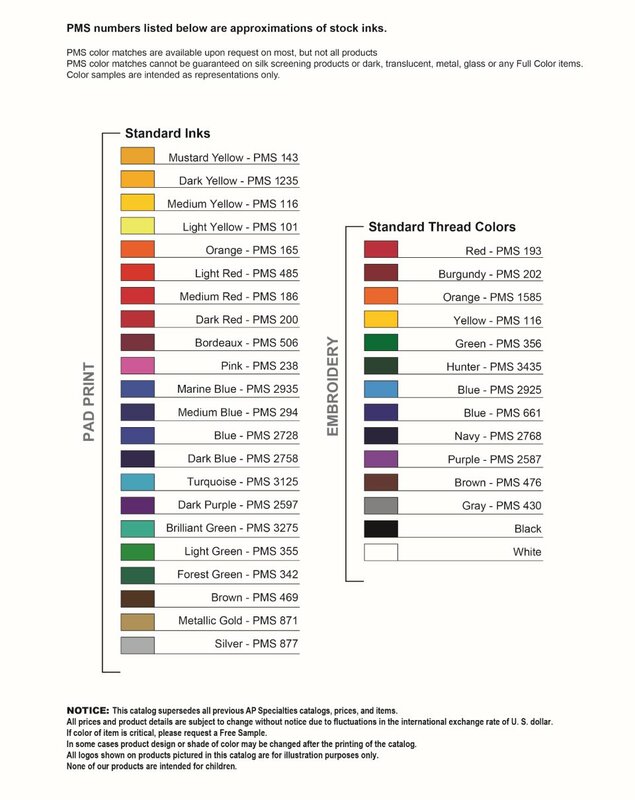 PMS color matches are not available on screen printed items. PMS color matches cannot be guaranteed on dark, metal, glass, translucent or any full color items. Color samples are intended as representations only. 1-color, 1-location printing is included on most products. Some products have other decoration methods. Set-up fees listed are for each color, location, and logo. Pens: $40.00; 2nd color and/or location Set Up Fee: $30.00. 2nd color and/or location Run Charge $0.20. Full color digital imprint available where indicated in catalog $50 Set-Up Fee per location. Each additional location run charge: $0.30. No Rush available for full color digital imprint. Embroidery available where indicated in catalog. $50 Set-Up Fee per location. Run Charge per location per item: $1.99. Imprint area varies per item. Maximum imprint area is 4 in x 4 in. 10,000 stitches and 12 colors maximum. No Rush available for embroidery. Two to four-color imprint for bottles available where indicated in catalog. For quantities over 500: $50 Set-Up Fee and Run Charge of $0.30. For quantities less than 500, $50 Set-Up Fee per color and Run Charge of $0.30. No Rush available for four-color imprint on bottles. Heat Transfer available where indicated in catalog. $50 Set-Up Fee per location. Run Charge for heat transfer up to 2 x 2: $0.99. Run Charge for heat transfer larger than 2 x 2 up to 6.5 x 3.375: $1.99. For heat transfers, larger than 6.5 x 3.375, call for quote. No Rush available for embroidery. Epoxy full-color logos available where indicated in catalog. 12-15 day production required for epoxy full-color logos. Set-up fee: $50.00. Quantities less than 500, an additional $75.00 surcharge applies. For additional locations, call for quote. If Laser engraving is included, the Set-Up Fee is $50.00. However, if the product states, “laser engraving available”, there is a Set Up Fee of $50.00 and a Run Charge of $0.50 per item. For additional locations, there is a Set Up Fee of $50.00 and a Run Charge of $0.50 per item. $60.00 Set-up Fee for each location and an additional run charge of $0.50 per item for each location, available where indicated in catalog. If exact reorder, set-up fee will be reduced by 50%.